It's now April 2018 and the on-line checker scene has changed a lot. This update reflects those changes. Availability of checker play on the web has declined almost catastrophically in terms of number of worthwhile play sites. However, you can still get a game most of the time. To make a long story short, there is one site that is outstanding, and one other site that is okay. Also known as Kurnik, and based in Poland, this is an outstanding head-to-head site, and is seemingly the only choice today. The English interface is just fine (and there are many other languages if you don't prefer English). 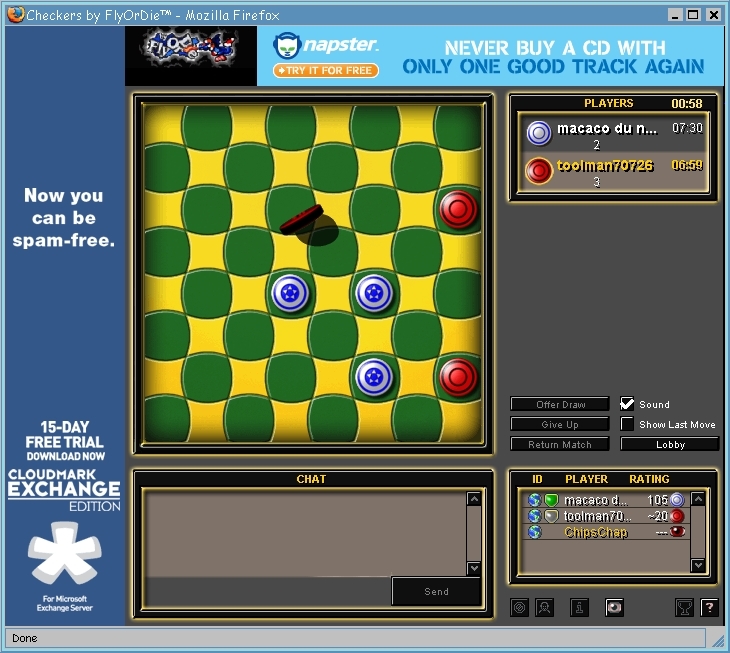 PlayOK provides a wide variety of game choices and a number of checkers and draughts options. International versions seem to dominate here, but if you want to play US rules there are generally some games available, and at times quite a few. Some very skilled players are found here, including, it is said, a former 3-move world champion. The table setup is something like Yahoo used to have, where you either fish for a slot or set a table up on your own. It seems players are rather serious here (and by the way, this is a completely free site). Rooms are arranged very nicely, with a wide variety of game time choices, including 3-move restriction, with the full range of 157 openings to select (or choose random select). PlayOK obviously has positioned itself as a top site for serious players to play. There were once checker tournaments; I can no longer find any of these, just draughts (international checkers). The board display and interface is very nice, with red and white pieces on a regulation green and buff board. The piece images are just a tiny bit fuzzy but the display is large and the overall effect is nice. Here is a screenshot. Java is not a requirement; the site features HTML5 coding and it works really well. The site has an internal rating system. Bottom line: the best head-to-head site for checkerists of all levels. 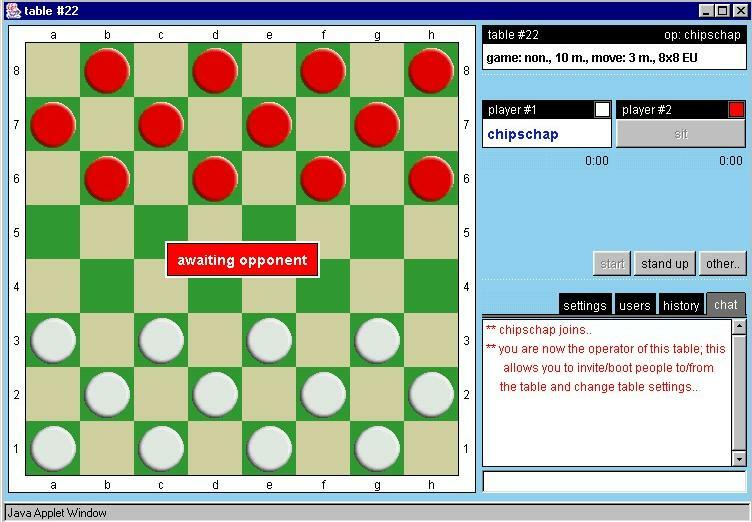 A very well conceived site which takes checkers (and other games) seriously. Thank goodness for the existence of PlayOK. This site is certainly different, as this screenshot shows. We are not sure what to call this board display. Kiddie-style? At least the pieces are red and white and the "squares" green and yellow. Well, surprisingly enough, you get used to it pretty quickly and it really isn't quite as bad as it looks at first glance. We nearly disqualified this site as "not serious" except that there appear to be numerous (sometimes as many as a thousand) checker players on-line at any given time, and a select few of them are skilled and serious. The site has a rating system; registration and play are free, and despite misinformation in their FAQ, Java isn't required. We're down to two sites worth mentioning, one of them clearly superior to the other. 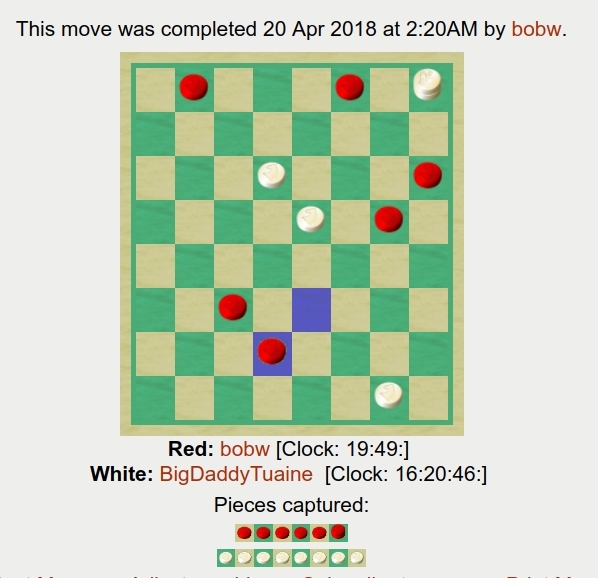 In addition, IYT offers "ladder" play with a number of choices of time limits, and a reasonably large number of participants (although the 3-move "Pro Checkers" ladders are conceptually broken -- you only play one side of an opening, not a pair of games). The display is more than adequate, although there is chessboard notation around the edge of the board! The move list used to be horrible (i.e. didn't exist except as a series of screen links) and we had in fact offered an independent translation service. There are also good features to allow paging through games, both yours and others. And, a nice touch: you can shield informal games from public view, but not tournament games. This seems to be exactly the right idea. One interesting note: It's Your Turn does not maintain ELO-style ratings. This can, paradoxically, a very good thing, and must surely cut down on cheaters and computer users (but, alas, not eliminate them). Just about all the other turn-based sites keep ratings, and there are always people who will do anything, fair or not, to boost their ratings. Getting a game is extremely easy and the frequent tournaments are attractive. A screenshot is here. So, head on over, sign up, and start playing, right? Keep reading. The site has been in maintenance-only mode for years and suffers from neglect. The site's customer service reputation is poor; that isn't out of malice, just indifference. The site owner has had the site for a long, long time. He no longer has any support staff, and frankly, I think he's tired out. The messaging system is primitive and poorly implemented (outgoing messages are not saved, for instance); and a few years back the site had some issues with its discussion forums, so the solution was to simply remove them altogether. Players tend to be much less friendly than on other sites, and with no message boards or club system, there is absolutely no social infrastructure. The only way to build up a network of player friends is to play in many tournaments and issue many open challenges. Nothing is done in the way of site updates and there have been no truly new games in a long time (just a few rule changes for some existing games). The site has a tired and old-fashioned look, and a badly needed modern makeover would increase ease of use as well as appearance. Broken links (like "free bumper stickers") simply don't get fixed. So what's the bottom line? If you want a lot of checker play, a lot of tournaments, and some good competition, it's here and there still is more sheer volume than anywhere else. But you'll have to accept the rest of the package: indifferent site management, and zero social infrastructure. It's your turn; you decide. Don't be put off by the name; this is not a "token" or gambling site. It is a site that is like It's Your Turn in that games are turn based over a period of time. You can play a certain amount for free, but memberships are quite affordable, ranging from $15 to $50 per year, and allow for a lot of excellent interaction and participation. The display is as good as it gets, with a very appealing choice of board sizes and styles including some of the most elegant graphics anywhere. There are many useful features such as move playback. You can observe other players' games as well. Server reliability and speed is more than adequate, and the site administrator has assured members that an off-site backup strategy is in place. There is a very strong sense of community that seems unique to this site. Getting a game is really easy; there are enough checker fans of all skill levels through at least intermediate to make this a good site. Some high-end players are here too, including some members of the American Checker Federation and the New Zealand Checker Association. There are checker tournaments roughly every month, although you need a paid membership for nearly all of these. There is a series of "clubs" available to paid members, and clubs often play each other or have ladders, which is a great deal of fun. The message boards and messaging systems are well done, very active, and quite uniformly courteous and polite. 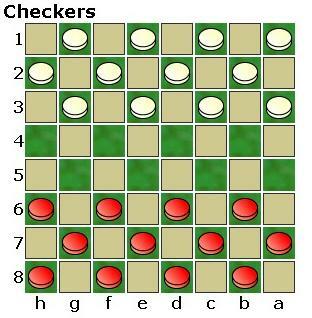 If you want to play a lot of checkers, joining one of the several on-site checker clubs will ensure it. GoldToken added a head-to-head playing feature some while back, but it was not well-conceived and gets almost no use. Still, it's an additional option, and there is a "hybrid" feature that allows you to transform a turn-based game into a head-to-head game if both players are on-line and wish to do so. The bottom line: playing on a site without putting up with constant swearing and innuendo, and run by a management staff that has a genuine interest in customers, is a pleasant experience (and unfortunately not a common one). There is plenty of value for the informal player, and the site offers a rich palette of games, features, and friendly individual and community interaction; you will, however, want a paid membership. Play head-to-head on Kurnik during their busier periods. Kurnik the best overall head-to-head game site. Gold Token offers the best balance of friendliness, cleanliness, and fun casual play, and offers some higher-end action with regular tournaments and great club play options. For turn-based play, It's Your Turn has the clear preponderance of play and frequent tournaments, but no social aspects and little to no management attention. Appendix: What Style of Play is Best for You? In our site discussions above, we've separately listed sites for head-to-head (HTH) and turn-based (TB) play. What are the advantages and disadvantages of each style, and which might be best for you? We once suffered from some misconceptions about this, but have cleared it all up. Here are some things to consider. Available time. We once thought that if you had just a little free time or lots of schedule constraints, you should play TB, since you just have to spend a little time each day making your moves. This idea, in fact, may be incorrect. If you have a very constrained schedule, you may actually not be able to play every day or two or three! This is especially so if your business life involves frequent or extended travel, or if you take vacations of a week or more. While some sites have vacation provisions, some do not (It's Your Turn, for instance, does not allow interruption of tournaments). This means that you're either scrambling to find a net connection or forfeiting games. And, as tournaments can go on for months and months (especially if you win a round or two) you may be making a much greater commitment than you might have thought. If you get involved in three or four tournaments, you may have 20 games going, and that can be a lot, if you want to do more than make any old move (which is a waste of both your time and your opponent's time). In addition, some tournaments run for a very long time (literally months and years). You might finish a round, and then the next round could start up three months later, at a very inconvenient time for you, and you're stuck with either playing when you don't wish to, or can't, or forfeiting your games. So, for the very busy person, HTH might be the better choice! You play when you have time and finish the games on the spot. Play Quality. TB play, when done in the right spirit, undoubtedly produces better games, at least mostly. The reasons are that you can use reference books (not computers though as that is generally considered cheating), and you can take a really long time (many hours if you wish) to choose a move. You can play out positions on a board; you can look things up in databases; you can try every conceivable variation. (This all takes time and touches on factor 1 above.) Now, not everyone, in fact, only a few players, actually do this, so you'll find that a lot of TB games aren't played all that well. But the prospect is still there, and some of the best games found are TB. Learning. It isn't completely clear which method of play is the better teacher; they both help you learn in somewhat different ways. With TB play, you can use lots of references. This is both bad and good. It means you'll be reinforcing your learning with good moves, not bad ones; but it also means that you might be just copying moves from a book rather than understanding what you're doing. With TB play, you can take your time and avoid most serious blunders; you can explore variants and really develop your analytical capabilities. This only translates partly into HTH or cross-board play ability, though, where powers of visualization, original thinking, and quick evaluation are all required. Some of the world's best TB players aren't so highly ranked in HTH play, and I'm sure the reverse would be true. A mix of both types of play is probably the best choice, if your free time allows for this. One difficulty with internet HTH play is that it is generally too fast, with games of 5 minutes per side, and usually even less, being dominant. 15 minute games would be a lot better, but then you'll have trouble finding players (the internet is all about instant gratification). Enjoyment. As we've mentioned many times on this web site, "it's supposed to be fun." If it isn't you're missing the point entirely. Both TB and HTH play can be very enjoyable, although at times we find TB can become a bit of a chore (especially if you've subscribed to too many games or tournaments and things pile up). You need to try out both styles to see what suits you in this regard. HTH play seems to have, for us, a little higher "fun" factor in that we can play as much or little as we want at any given moment. There are no extended commitments which might become a burden at times. In times to come: There are surely more out there. If you know of some that we should spend some time at and then review, write me at bobnewell@bobnewell.net and let us know about them. Errors, inaccuracies, and unfairness: Please write bobnewell@bobnewell.net and let me know, so we can make amends and corrections, if warranted. Our reviews are completely independent and we "call them as we see them." However if we have made incorrect statements or given incorrect ratings, which can be refuted with facts, rather than opinions, we will be happy to make necessary changes. Bob Newell, Honolulu, Hawai`i; last modified 04/20/18 .